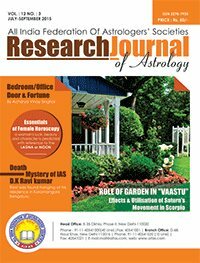 This Issue of Research Journal of Astrology contains discussions on Various topics of astrology like Retrograde Saturn (Misfortune for Modi and Kejriwal), Moon Plays Pivotal Role in Deciding Destiny, Rudraksha Planets Colours Plexus, Essentials of Female Horoscopy, Death Mystery of IAS D. K Ravi Kumar, Rahul Gandhi, Bedroom / Office Door & Fortune etc. Besides that this journal contains several good articles in hindi as well. In addition to that it also contains informative and interesting articles on Vastu and Fengshui as well .